... all of the time. I've been gone along time again. Truth be known, I've been fairly exhausted in focusing my thoughts on other writing projects including preparation for my preaching efforts. Ive been feeling intellectually, spiritually and emotionally... somewhat drained. But the hour is late (and I don't just mean that I'm typing in the midnight hour). A lot has happened recently in politics and it requires comment... so I had better at least try to weigh in with a semi decent effort. Before exploring my motivation for writing this piece, lets look at the fundamental cause of the recent political troubles - the scandal over MP's expenses. What has happened is simply disgusting. There is no other word that sums it up so succinctly. That so many of our parliamentary representatives have been caught red handed, angers the public deeply... and rightly so. I think deep down many people knew or at least suspected on some level, that this was going on...but just got on with their own lives... but it's now, when financial hardship begins to pinch that this issue is particularly sensitive (though I personally believe it should always be so). I think what has offended the public most deeply, is the fact that those who have been caught (to whatever extent), have actually tried to defend their position. "I acted within the rules at the time" they cry. So what? They knew full well that the rules were wrong but they were content to ignore that little fact as they used the letter of the law to completely wallpaper over the spirit of the law. The worst offenders have pledged to step down at the next election and have written cheques to pay back what they have stolen (for lets name the act for what it is). Frankly this is not enough. I don't agree with David Cameron's stance of using the outrageous crimes of his parliamentary brethren to get a general election (though it looks like events are conspiring to that effect anyway, irrespective of his appeals). It is not the time to make political capital out of this steaming mess (he knows his party is far likely to be less severely damaged by electoral disaffection). However, I do believe that immediacy is needed. If it happened in any other workplace, the culprits would be on a charge of gross misconduct and out on their ear... and this should be no different. I believe in every case where there is provable deliberate fraud, there should be a By Election... no matter how many seats that affects. Furthermore, as a gesture of goodwill, I believe the politicians should follow the biblical example of Zaccheus. He was the tiny taxman who defrauded his community out of their hard earned coinage. However, upon meeting Jesus... Zaccheus had a change of heart and offered not only to pay back what he taken... but to multiply it fourfold. I'm sure if you suggested it to the MP's caught in scandal, they would be spitting their tea out at this suggestion... but here is my point. Giving back what they took, merely shows a grudging acknowledgement that they were caught red handed. It is not an act of contrition. True repentance requires that we go over and above what is expected of us on paper... we actually need to demonstrate a change of heart by what we choose to say and how we choose to act. What is required for the main parties to regain some serious trust... is for someone to stand up and make some really tough calls... REALLY tough ones. Although Cameron has made a few steps along this road, none of the main party leaders have truly been active on this... or taken any risks. They promise reform but that takes time... and as the Bible teaches, you shouldn't put new wine in an old wineskin (or in this case "new rules in corrupt parliaments"). In fact, such is the concern that... last week the two leading ministers in the Anglican Church stepped forward and made a direct appeal against the BNP. When I heard the joint statement issued by the Archbishop of Canterbury - Rowan Williams and the Archbishop of York - John Sentamu that decried the BNP, I was deeply impressed. Yet unbelievably, there was a barrage of letters in the press complaining that the Church of England should not be telling people how they should vote. Under ordinary circumstances, I would normally agree... but these are NOT ordinary circumstances and the British National Party is NOT a normal political party. We are living in extraordinary times... politics is in a state of complete upheaval. The row over MP's expenses has broken wide open. Lets not forget that following the Holocaust, Pope Pius XII was strongly criticised for not speaking out against the persecution of Jews... in fact he did apparently make some critical statements... and gestures, but his contribution is largely regarded as too little too late and mostly given when it became politically safe/convenient. Whether you believe his actions were sufficient or not, my point is that people were critical of him for not acting in the face of such an oppressive destructive political beast as Nazism. Yet now, people are criticising churchmen for doing the opposite. Are they insane? Do they not see the parallels? It is absolutely right that the Church stands up against the BNP, particularly when it is a known fact that the party is making insidious attempts to win over Christians who are (rightly) annoyed at the prospect of political correctness seemingly stifling public expression of belief. Jesus Christ lived as a Jew in a nation occupied by a foreign invader, one which despite allowing Jewish culture to continue... made sure it's own cultural ideas were firmly imprinted upon the land. How did Jesus treat these foreigners... did he endorse the idea of insurrection against Rome? Jesus Christ even went as far as healing a Roman official's son. However, we are talking persecution are we not? So how did Jesus react to persecution... did he throw his lot in with the Zealot guerrilla terrorists? Jesus allowed the Romans to mock him, beat him to a pulp, flog him and crucify him... and he still had the loving audacity to call upon his Father to forgive them. 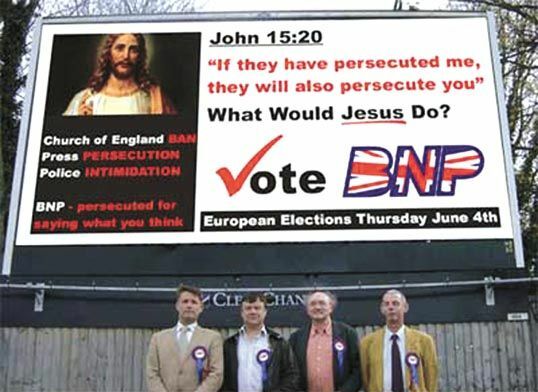 Ultimately, Jesus does not make a good poster boy for the BNP... and neither should any of us who are Christians. You see if Jesus and his apostles (following the ascension) had not accepted outsiders... the Christian Church would be nowhere near as significant in size as it is today. Peter would not have met Cornelius, and salvation would not have been known among the gentiles. Similarly Paul... if he had not immersed himself in the many cultures of the Roman Empire provinces, would not have been able to use his observations of their customs, in proclaiming the Gospel to them. And let us not forget that in following Christ, we admit we are aliens and foreigners on this Earth... and our "nationalism" is in the final analysis, reserved for God's Kingdom. However, I don't need to go into a long and drawn out theological diatribe as to why Christianity is not compatible with the BNP's "policies". "You have heard that it was said, 'Love your neighbour and hate your enemy.' But I tell you: Love your enemies and pray for those who persecute you, that you may be sons of your Father in heaven. He causes his sun to rise on the evil and the good, and sends rain on the righteous and the unrighteous. If you love those who love you, what reward will you get? Are not even the tax collectors doing that? And if you greet only your brothers, what are you doing more than others? Do not even pagans do that? Be perfect, therefore, as your heavenly Father is perfect." If you have been tempted to vote for the BNP... or even if a small part of your heart sympathises with them; I urge you to take a good look again at the scripture above and pray about it. Weigh your heart against God's Word and see if in all good conscience, your position is defensible? I make no secret of my vehement opposition to the very existence of the BNP and I feel burdened to speak out against them because of my conviction that evil succeeds when good men fail to act. Good to see you blogging again, Nick. I've missed your words of wisdom. I couldn't agree more with your views on the expenses scandal. It's gone from disgusting, thru outrageous and darkly comic to downright worrying. It makes you wonder who's left actually running the country now. As for the BNP, well, before reading your piece I was just thinking about how people use God and scripture has a diversion or a cover for their various motives. In chat rooms, the ones that have holier than thou screen names invariably turn out to be the dodgy ones. It's frustrating the BNP usinging scripture used so badly out of context to trick unknowing members of the public. But faulting attacking for their religious 'beliefs' is akin to hitting a guy with glasses - it's just not done and the BNP are using that kind of mentality to ward off anyone that would point out their blatantly racist and ungodly policies.